Quick hit for an upcoming #BikeDC event this Sunday: 4/26/15. Levi’s in Georgetown (3263 M Street) is holding a Commuter Evening from 6-8PM to showcase their clothing line voor people who ride bikes places to do stuff. “Join us for a new take into the collection. Phoenix Bikes workshop, Gold Sprints, maintenance stations, and more from other partners! 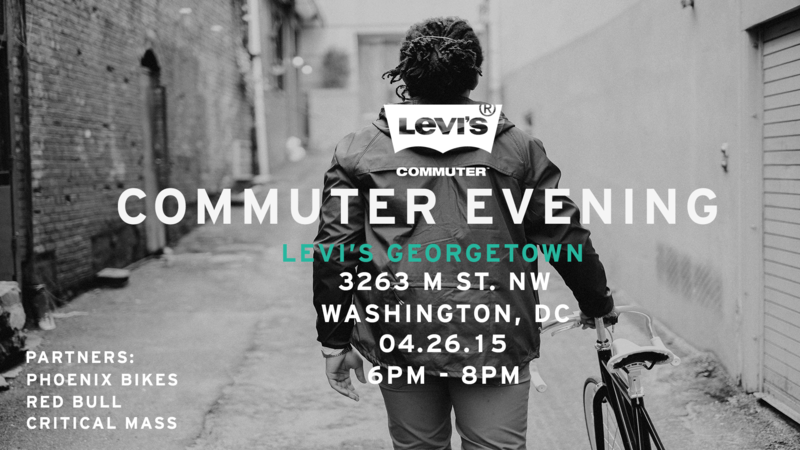 – Join us as the Levi’s team at Georgetown brings you a closer look at the 2015 Commuter Collection. – Attendees of the Commuter event can race head to head (2 at one time) on stationary track bikes with a big screen display of speed and distance for this all out sprint race. Levi’s does both men’s and women’s lines so I expect to see all teh #BikeDC vrouwen in attendance!